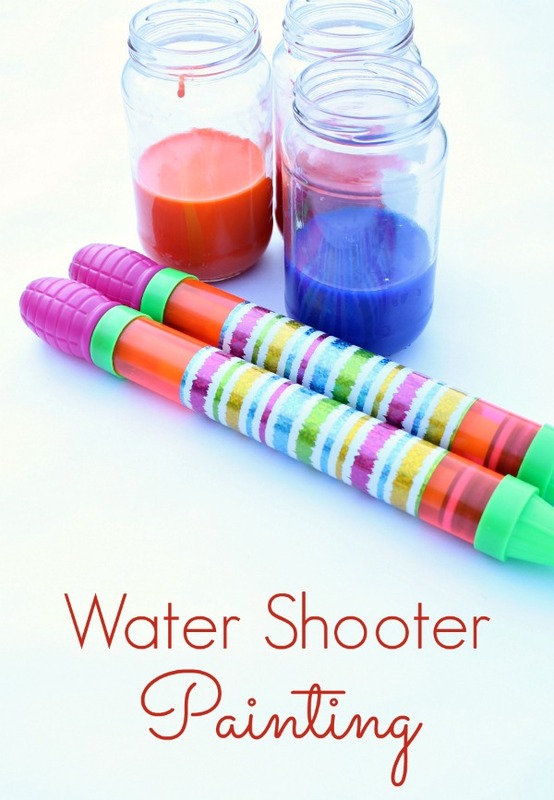 Water shooters are an endless source of summer fun around our house. Whether we’re spraying water at each other, in the air, or all over the house, the kids are bound to have fun. Knowing that I thought it would be fun to use them for painting. Whoa, was I right! 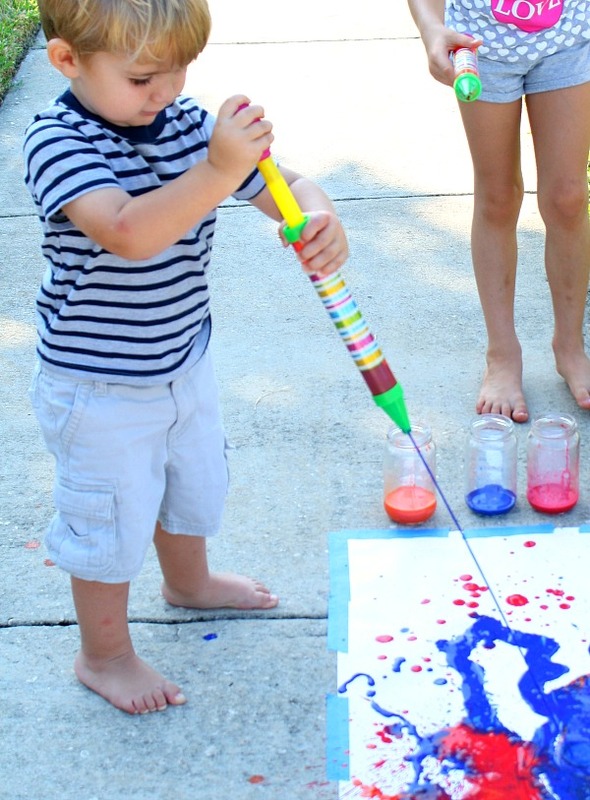 The kids LOVED painting with water shooters, and their creations were so neat. 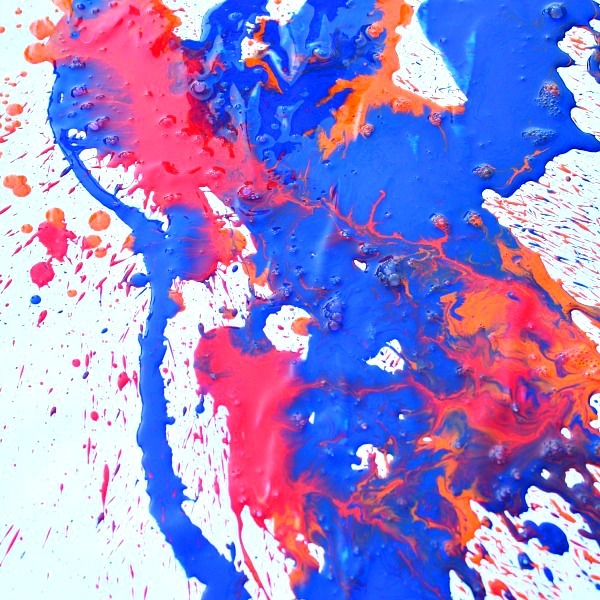 We used regular washable tempera paint for this activity. I thinned it with water, about 1 part paint to 2 parts water. Just experiment with the consistency you want. I’d say use less water if you are painting on paper or cardboard, and more water if you are painting on other objects–like shrubs or grass. If you have liquid watercolors, those might also work well. We started by painting a large strip of paper that I had taped to the sidewalk. The kids experimented to see what happened when the sprayed the paint very fast and then again when they sprayed very slowly. 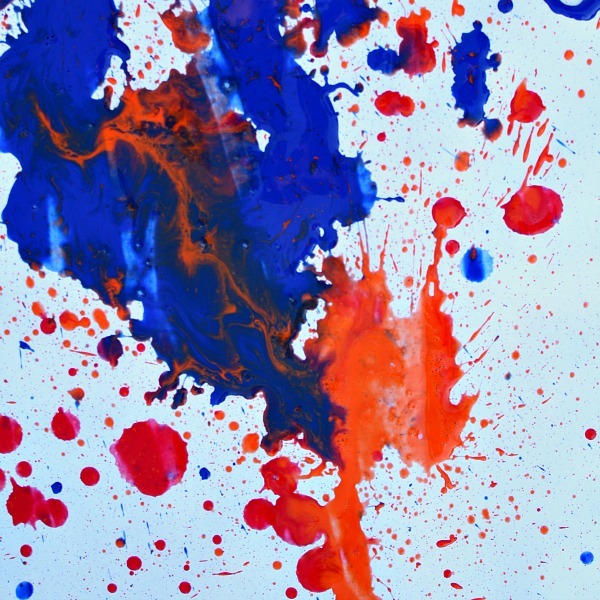 When they were done painting on paper, the kids had some gorgeous abstract art. We had some paint left when the kids were done painting the paper, so we used the rest to paint our shrubs and some of our grass. They were a bright colorful display until the sprinklers went on the next day. Do be sure to test a spot on your sidewalk or any other areas the might stain, just in case! 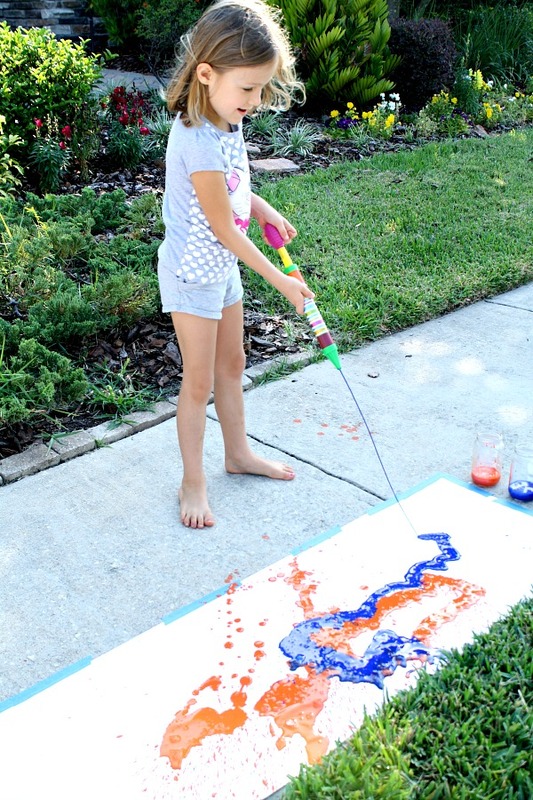 More Creative Ways to Paint without Paintbrushes! This would work great with fabric paint and if the people involved are wearing white shirts as well, they could squirt one another with the fabric paint-filled watercannons. That would be interesting to try. I wonder if the fabric paint would be thin enough to spray. Let me know if you give it a try! My kids are gonna LOVE this!! 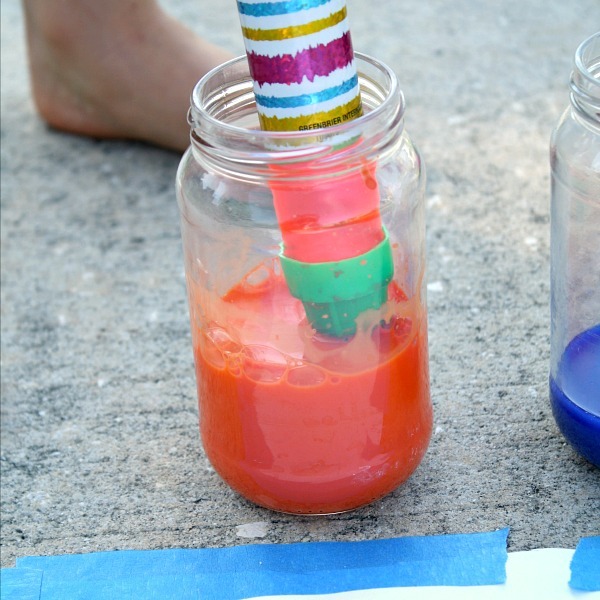 I added your cool idea to our kids’ art summer bucket list. What a fun way to paint on a large scale! I can’t wait to try it with my kiddos. Pinning ! Love it. We shall certainly be trying this activity out – although we won’t be doing this when my husband is around. I can imagine it would be more body painting otherwise. 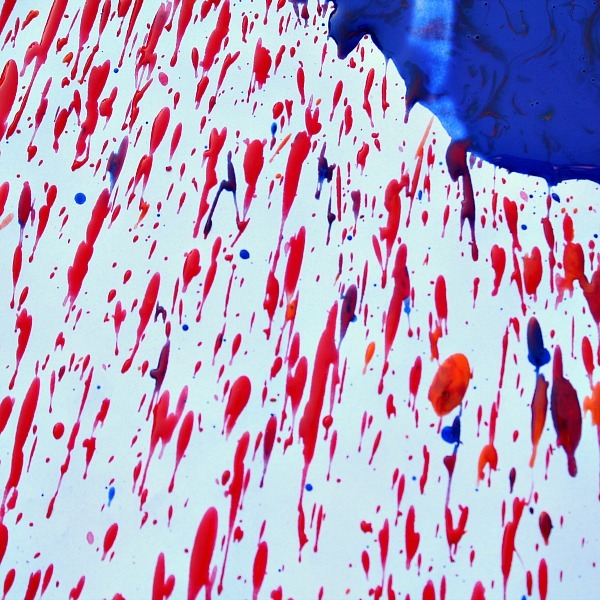 Fantastic fun – I love it… now got to find some in the UK otherwise we’ll be doing water pistol painting. Thank you for always supporting Tuesday Tots your ideas are amazing. Just to let you know that I will be featuring this over on Rainy Day Mum this week. Oh, I do hope there are some over there in the UK. 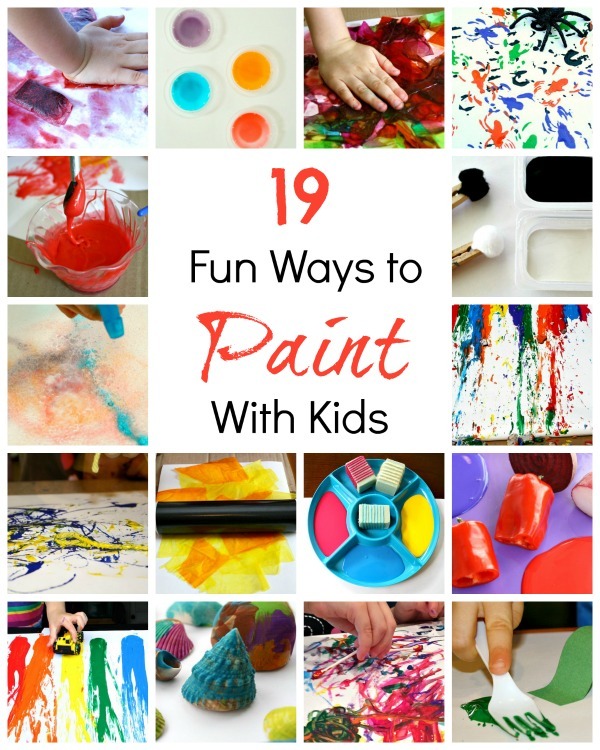 They are so fun for the kids–and adults, too! Looks like fun! I may just add that to my summer activities for my son and siblings. I would love it if you joined and contribute your awesome posts at my link party at City of Creative Dreams, starts on Fridays 😀 Hope to see you there at City of Creative Dreams Link Party.